Free UK delivery on orders over £30 (ex VAT). For orders under £30 (ex VAT), you will be charged an additional £4.95. Products will be delivered by a courier Monday to Friday, between 9:00 am and 5:00pm. Unfortunately you are unable to request a specific delivery time. It is easy to track the progress of your order via email or in My Account. When your order is dispatched from our warehouse, you will automatically be sent an email that includes the courier name, a tracking number and a link to the courier’s tracking service. Alternatively, you can log into My Account , where all of your orders will be displayed in the My Orders section. Click on the ‘track’ link next to the order that you’d like to view the tracking information for to see the progress of your order, including when it left the depot. We suggest you log into My Account, go to My Orders and select the ‘track’ link next to the order that you would like to view. It will show your order’s progress to your door, including when it has left the warehouse and if it is on its way to you. If you have ordered furniture, large technology items, safes or selected business machines these products are delivered by a specialised courier service due to the size and weight of these products. The courier company will contact you the day prior to delivery with an expected delivery time. These products usually take 3-5 business days for delivery. If you need further assistance, please contact us online or call 0808 169 6971, Monday to Friday, 9:00am to 5:00pm. If you are a new customer, you can add your delivery address when you place an order during checkout. This address will be saved for future use in My Account Details. You can then add or delete delivery addresses after you have made your first order. When you are in the My Account section, click on My Account Details to view your current address book list. There you can add a new address, delete an existing address or change your default delivery address. Delivery and billing address so we can ensure your order and invoice arrives safely. After you provide these details they will be stored for quick and easy future shopping in My Account. 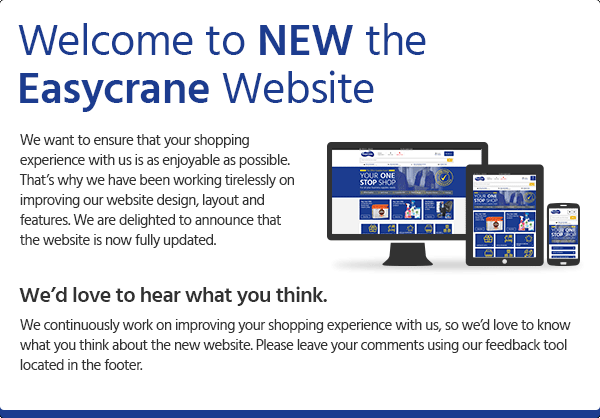 My Account is available to all Easycrane Ltd customers. In this section you can track orders, start refunds online and keep track of customer service queries. To register, click on Login/Register in the header. Alternatively, if you are purchasing an item today you can also register as you proceed through the checkout process. It will take just a few minutes to complete the application for an Easycrane Ltd account, with all decisions made within two business hours. For existing business customers, you can apply for an account when you are paying for an order during checkout start an application now. For further information on your privacy and security, please contact us online or call 0808 169 6971, Monday to Friday, 9:00am to 5:00pm. You can make a payment using BACS with the information below. For further information, please contact us online or call 0808 169 6971, Monday to Friday, 9:00am to 5:00pm. Past purchases - search for and re-order past purchased items by date and order number. If you have forgotten your password, hover over Login / Register in the header and click on ‘Forgot Password’. You will need to enter the email address you used to initially register as a customer. An email will then be sent to that address to confirm the request to change your password. If you are unable to remember your email address you used to register please contact us online, or call 0808 169 6971, Monday to Friday, 9:00am – 5:00pm. Company Details - including key business information and details. Communication Preferences - set and manage your preferences. Manage Saved Card Details - edit your card details if you have saved your card details previously. Manage Addresses - add or delete multiple delivery addresses. Yes, you can. Simply login and go to the My Favourites and Past Purchases section in My Account. If you would like to claim a special offer or discount, all you need to do is click on the banner or text link. You will be automatically taken to an Ecoupon page where you will see the terms of the offer e.g. Buy 2 get 1 free. Add the relevant items to your basket and the offer will be applied. After you have confirmed and placed your order, we are unable to apply an E-coupon. Please note that you can claim just one Ecoupon per order. If you need assistance at any time, you can contact usonline or call 0808 169 6971, Monday to Friday, 9:00am to 5:00pm. You will need to log into your Easycrane Ltd account or register as a new customer before you place an order using an Ecoupon. Register or Login now..
You may not have reached the minimum purchase requirement to use the e-coupon so it may not show on your order. The offer applies to your subtotal before VAT and any delivery charges. To start the returns process online, login and go to My Account / My Queries / Create a New Query, choose the relevant order and item (if item-specific), provide some details and press the ‘send’ button. Alternatively, you can call our customer service team on 0808 169 6971, Monday to Friday, 9:00am to 5:00pm to start the returns process. To return an item or arrange a collection and reorder, you will need to contact us within 14 days of receiving the item. Some computing or technology items need to be returned sooner, so please check with our Customer Service Team if this applies to you. You can contact our Customer Service Team on 0808 169 6971, our phone lines are open between 9am to 5pm, Monday to Friday. If all of your items are available for next day delivery, they should be delivered at the same time. If your items are a mix of next day delivery and 3-5 business days delivery, they will be sent to you on different days depending on stock availability. If you are unable to find the missing item, you will need to contact us within three 3 days of receiving your order. You can contact us online or call 0808 169 6971, Monday to Friday, 9:00am to 5:00pm. If you have confirmed and paid for an order, unfortunately you will be unable to edit or cancel it. For further information, you can contact us online or call 0808 169 6971, Monday to Friday, 9:00am to 5:00pm. We can offer you a refund of what you paid for your item, but are unable to refund the original delivery charge of the returned product.